How do I order a wedding cake? Please call the bakery for an appointment for a wedding cake consultation. The appointment usually takes about an hour and we have a tasting selection for you and lots of pictures to design your cake. How many layers will my wedding cake be? The number of layers is determined by your final number of servings needed. If I am using ribbon what kind of ribbon should I get and how much? Grosgrain or satin ribbon works best if the icing is buttercream. If the icing is fondant, any ribbon will work. However, please do not purchase wired ribbon! 7/8” to 1 ½” wide is good and we need 8 yards total. Who gets the flowers for the cake? The bride and groom should contact their florist regarding cake flowers. The florist can leave the flowers at the reception site so that they can be put on the cake. The Bake Works staff would be happy to talk to the florist about the kind and amount of flowers if necessary. Our wedding cakes start at $6+ per serving. The price depends on the complexity of the design and the flavor of the cake as well. The rule of thumb usually is about six months before the wedding. 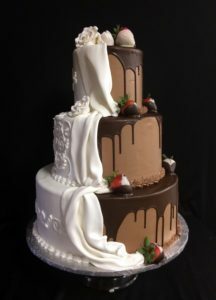 How does payment work for wedding cakes? The Bake Works requires a 33% deposit to hold the date. That deposit is non-refundable and goes toward the final balance of the wedding cake. Two weeks prior to the wedding the final number of servings is due, as well as the final payment is due. Do you still save the top layer for the 1st anniversary? Yes, you can if you want to. The top layer can be not cut and boxed for the bride and groom, just ask your wedding venue. To preserve the cake properly do the following; place the cake in the freezer, in the box for 24 hours so that it is totally frozen, then take the cake out, wrap the cake in saran wrap and place back in the box. Then wrap the box tightly in foil and keep in freezer. To thaw, unwrap box and cake and leave out at room temperature for a day. Enjoy! I have a topper for my cake – what should I do with it? The cake topper should be left at the reception site and we will put it on when we are setting up the cake. Do you make groom’s cakes? Absolutely! Go to Cakes for Him to see some designs.